Situated on a pastoral 4,200-acre estate in the foothills of the Great Smoky Mountains in Tennessee, lies a sprawling farm with posh country-chic guestrooms, gourmet cuisine and an astonishing array of culinary and outdoor activities. Upon arrival at this picturesque destination, it is immediately obvious why Blackberry Farm should be on everyone’s must-experience list. A glimpse of authentic America, Blackberry Farm gracefully blends farmstead living with the style of a bygone era and modern amenities, making it an ideal escape for couples, food and wine aficionados and families with children. Warm and welcoming, the cottages are the perfect blend of luxury and comfort, a contemporary experience with the elegance of old world antiques. Our favorites are the Farmstead Cottages (featuring a glass-enclosed porch in the woods with a fancy wooden swing and fireplace—umm, yes, please!) and the uber-luxe Boulder Cottage, with an idyllic outdoor fire pit and spa. Each cottage also conveniently comes with your own personal golf cart — a fun way to zip around the property and discover hidden gems throughout. A true farm-to-table culinary destination, mostly everything on the restaurant menus comes from just a few yards away. When is the last time you stayed at a resort with a cheese maker, beekeeper and butcher on property? The food is truly incredible, and all included, so get ready to feast on some deliciousness (and maybe pack on a few pounds). You’ll enjoy delectable breakfasts and lunches at The Dogwood, Blackberry’s more casual café. But the highlight is the gourmet dining at The Barn, a more upscale culinary experience in a magical rustic-chic setting. For an amped up epicurean adventure, indulge in the Chef’s tasting menu with wine pairing – an extra cost, of course, but also extra memorable. There is a vast wine cellar sure to impress even the most discerning wino, and foodies will appreciate the seasonal, culinary-focused activities like picking hazelnuts in the orchard, foraging for chanterelle mushrooms and chef-taught cooking demos. If your alcohol of choice is a good ‘ole ale, Blackberry Farm has mastered craft beer with their very own on-site brewery that produces over 30 unique bottled beers. If you’re looking for some rest, relaxation and rejuvenation — you’re in luck... 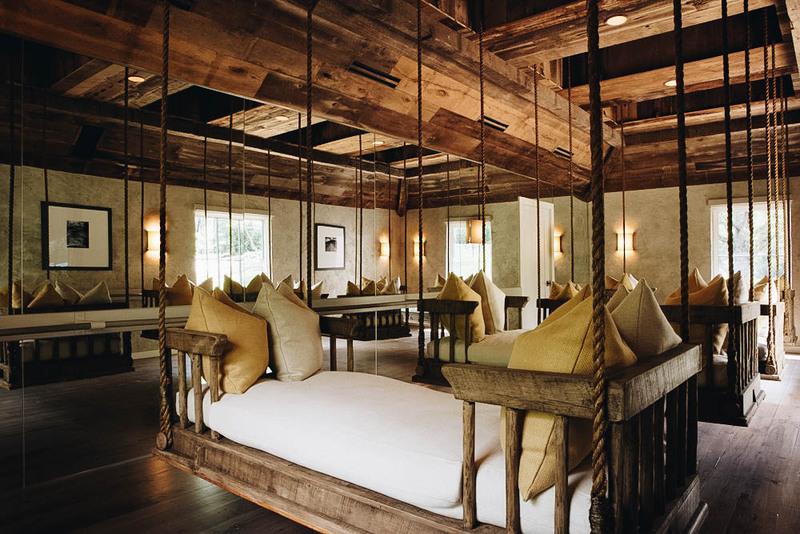 The Wellhouse at Blackberry Farm is a stunning spa sanctuary (with the most incredible relaxation room!) and wellness retreat, offering endless seasonally inspired treatments and fitness activities galore. From the heavenly Galvlati (‘Gah-Luh-La-Tee’) fourhanded massage to the tempting Lavender + Vanilla Bourbon Body Drench massage, it’ll be hard to choose just one. Should you wish to work up a sweat, there’s every class imaginable from Zumba to Barre — and even an option to tailor it to your likings with private, one-on-one sessions. Family fun calls for playing on the farm with the cutest truffle dogs and littlest sheep. There's also a handful of other family-friendly activities that you can all do together, but if you’re wanting a great kids camp – Blackberry Farm has it! For kids ages 4 and up, Camp Blackberry and Blackberry Youth Discovery are really great as half-day and full-day options! Camp Blackberry offers adventures tailor-made to your little ones' likings such as culinary, fine arts, outdoor adventure and more. Camp Blackberry is included in Family Time at Blackberry Farm or is available as a supplemental option. Youth Discovery is a supplemental opportunity for youth ages 10 and older to experience more in-depth learning in areas such as painting, ceramics, farmstead and adventure activities. In addition to the daily happenings throughout the year, Blackberry Farm hosts a number of seasonal events for those seeking a more curated experience. Discover the calendar of events at this link.